NY Steak Shack’s Buy 1 free 1 promotion is back! Only three days since the 11.11 bargain fever hit and many are already on the prowl for the next sale. 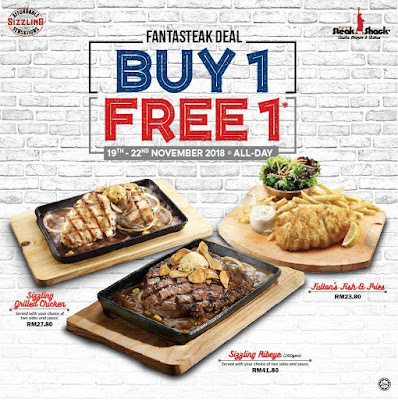 For those of you who missed out on exclusive deals this year, fret not, NY Steak Shack has got you covered with its all-new Buy 1 Free 1 promo! Running all day from 19 to 22 November 2018, guests will be entitled to a Buy 1 Free 1 deal from a selection of three NY Steak Shack signature entrées. These include the signature Sizzling Ribeye Steak (200gms) grilled to perfection worth RM41.80, crispy and savory Fulton’s Fish and Fries worth RM23.80, and the exquisitely marinated Sizzling Grilled Chicken worth RM27.80. All you’ll need to do is purchase one dish and you’ll get another free-of-charge! The first steak shack in Malaysia to receive HALAL certification from JAKIM, NY Steak Shack offers affordable meals, enticing discerning meat lovers with affordable prices – a mere fraction of what they can expect to pay at other conventional steakhouses. NY Steak Shack’s first outlet was opened in July 2014. Currently, there are eight outlets located in the Klang Valley, with additional outlets in the pipeline.